See. Taste. Hear. God is so eager to give us the good news about Jesus that he uses all of our senses to do it. Reading our Bibles privately is one way to take in his message. But it’s not the only way. In fact, it’s not actually the primary way. Today I want to talk about the central place of hearing the good news through the preached word. And not just through MP3 downloads or podcasts, but in person at the church where you are a member. What should we listen for? How does it change my at home Bible reading? Why should the preached word be primary in the believer’s life? Because it is God’s appointed means for his message, Christ crucified and raised for us, to be spread. Timothy was then told to guard the message and pass it on to the next generation. That’s why today true faith in Jesus still “comes by hearing, and hearing by the word of God,” a word that is only heard because it has been preached. Romans 10:14-17. So hear I am sitting in church, and my pastor, preacher, rector has just stood up to deliver his sermon. What am I listening for? I’m listening for the proclamation of news, the great news of what God has already done for me in Christ. Not 10 tips for a better marriage. Not 5 ways to be a better Christian. And definitely not self-help advice or heart-rending calls to help others. In short, I’m listening for Christ to be preached from whatever text the pastor has chosen. I want the truths of the gospel to arise from the Biblical text, too, not just from the pastor’s personal experience. And I want to hear a message from God in community with other believers. The fact is I’m going to need to sort out the implications of the sermon, and I’ll need help to do that. I want the company of others who have heard, been encouraged, experienced conviction, and received mercy to help me apply the gospel to whatever I’m dealing with. And I want to help them. That’s how I grow as a Christian, by placing myself under the word of God and in community with the people of God. Why bother with reading my Bible at home, then? Or going to a Bible study? Because the preached word, understood and believed, changes me. It gives me ears to hear the gospel in the pages of my Bible during the week. Hearing words doesn’t mean we understand them. As my gospel preaching pastor takes me through the Bible, I learn how to understand the Bible for myself. I begin to see Jesus in the Old Testament, taste God’s grace in passages about the law, and hear the good news when I’m bracing myself for bad news. I even begin to hear God’s tone of voice through the voice of my pastor. He’s not just preaching, he’s ministering the word of God to people he knows well. The choice of text, topic, and even illustrations reflects his relationship with those sitting before him. I can feel that, and begin to recognize the voice of my great Shepherd in his words. So let’s hear the good news sisters! First from our pastor, then from our own Bibles, in private or in studies. That word will then dwell richly among us as we share our joy in believing it together. This is astounding…you are the first person (in evangelical circles, that is) I have ever heard of that has raised man’s message above that of God’s Word. This MIGHT work if every preacher in every church actually preached the true Word of God, but the sad truth is that not many do. They insert their own words, own ideas, own beliefs. The only way it would be true is if the preacher (or someone) got up at the podium and read from the Bible word for word and did not change it. 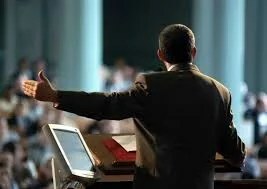 The preached word, if from God’s Word, is invaluable, and I agree that God meant for men to preach to gospel. But to say that the pastor comes first and then from our own Bible is shocking, In this day and age, to encourage women to put that much faith in their pastor without even warning against being like the Bereans is just, well, astounding. You may have a great man of God in your church’s pulpit, but many do not. Many pastors are not filled with the Spirit and preach their 3- or 5-point sermon with much fallibility, even preaching other gospels, which is no gospel at all. This brings to mind the Catholic Church raising the Pope’s word above God’s own Word. I think you have done your readers a great injustice, and this post needs to be taken down. Thank you for engaging with me on this, Liz. You’ve raised important issues and I’m glad for the chance to clarify. First, let me clarify what I’m not saying. I’m not saying “don’t study your Bible.” Direct contact with God in his Word through the Spirit’s illumination is the special privilege of every believer. I’m also not saying “don’t be a Berean.” I affirm the responsibility of God’s people to know their Bibles well enough to discern if the pastor’s message is true to Scripture. You’re right. Not every pastor preaches the good news of Christ crucified, buried, and raised for us. That’s the tragedy of today’s church. The type of preaching matters so much that I believe gospel preaching should be a primary criterion in choosing a church or changing churches, ranked above worship style or programs. What I’m advocating is classical Protestantism–the stream flowing from Calvin and Luther and the English Reformation. American individualism has affected the church in America and affects everyone of us. Those are the glasses we wear as we read our Bibles. (For example 1 John 2:27 was written to the church not just to the individual. The plural “you” is used.) The public ministry of the word under a godly pastor helps to correct that cultural bias. This is getting long! I’ll put the rest of my thoughts in another post. So good! We are feeling this right now so much, we minister at this retreat center but most retreats are in weekends so we miss church 70% of the year! That’s a lot! Not only do we not hear the word being preached from the pulpit, sitting there without the distractions, and allowing God to meet with you. But most of all, we miss the community/family. We miss park play dates, we miss making meals for the new mom or the hospitalized person’s family, we miss showing up at our friends house, who is buried in moving boxes ready to help, we miss the one on one talks and sharing our hearts and many times all that is needed is a compassionate hug. Yes we hear podcasts and sermons, yes we share with each other but let me tell you it isn’t the same. We have 200 people come at the center at a time but they come and go. You don’t know what you have till you have it no more….. Thanks for sharing this Adina. That is truly a sacrifice, which I’m sure the people you serve don’t realize you are making. God bless you friend!